Was gold dumped last Friday? Perhaps paper gold was, but not physical gold. The Comex is a futures contract trading venue. 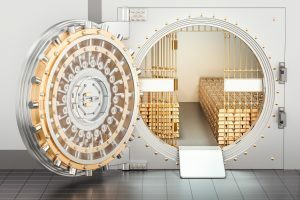 While its vault operators issue daily reports that allege the presence of 100-oz gold bars in custody, we have no idea if those bars are physically in the vaults or whether there are any encumbrances attached to them. Very few holders of gold contracts take delivery, and little physical gold moves in or out of Comex vaults. In short, the Comex is a paper gold trading exchange. On Friday June 15, after the primary physical bar trading markets—India and China—were closed for the weekend, large quantities of paper gold futures were dumped into the CME’s computer trading system before the Comex gold pit opened. It’s not uncommon for the gold price to be smashed by paper gold on the Friday after an FOMC meeting, especially in the summer when trading operations are at half-staff and the rest of the world is off for the weekend. From 8 a.m. to 9 a.m. EST, approximately 90,300 contracts (9.03 million ounces) were sold. But Comex vaults were reporting total gold stock of 9.01 million ozs, only 507,453 of which were listed as available to be delivered. In one hour, the total amount of gold allegedly held in Comex vaults was dumped in the form of paper derivatives. Worse, the amount dumped was 17.7x the number of gold ozs available to deliver. For the entire day, contracts were dumped (49,536,640 ozs of Comex paper gold). Kranzler bets that China and India will be aggressively buying more than their usual daily amount of physical gold in order to take advantage of the lower price. Funny that Trump would enable the Chinese to buy cheap physical gold when he’s engaged in a rapidly escalating trade war with them.